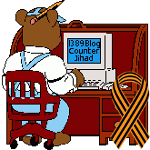 2013 September — 1389 Blog - Counterjihad! How Muslim terrorists infiltrated Westgate Mall in Kenya: They rented a shop! in 1389 (blog admin), crime, dogs, food and drink, Now this is disgusting!